"Secondary Inspections," "Greyhound," and "Confessions"
you know that you’ll never pass for who you are. Everyone foreign claims your face. “Where were you born?” and “How do you say ‘Hello’?” You answer fearing hatred. Fear you came by naturally after strip search and secondary inspections. Not beautiful. Black, Columbian woman says. Not here, you’re Toucan Sam, you’re a Jew. lips full, not too ethnic, unless ambiguous, not too angular, no rough edges. Beautiful. desire to make America white again. You are zoo animals watched by hatred. You fear reaction to your ancestral aura. You find hidden outposts of hatred. No use saying you are second generation born in America, land of the beautiful. You go with your son on a field trip, “What tribe are you?” Cherokee guide asks. “where are you really from?” when you answer. Shows no hatred. “From Russia, Hungary, Palestine, Turkey,” you say and tell him you’re Jewish. there.” Here, your Black son looks like someone they might shoot or run from. Will they look at our faces, hear an unspoken word and ask? You wonder: In New York, will I be beautiful, will we be safe? Jew and Afro-Jew. except maybe—well there is this. “Mothers Hall of Shame.” Would it help if I told you I saved his life more than once? power. It takes a superhero to wrest it off. who will always be there, is enough to clean up those stains of shame. How much do I love you? Infinity is all. 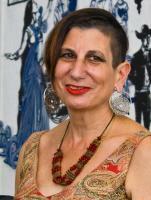 Carla Sameth is a writer and mother living in Pasadena. Her work has appeared in several anthologies and other publications such as Brain, Child, Brain Teen Magazine, Mutha Magazine, Full Grown People, Brevity Blog, Angels Flight Literary West, Tikkun, Entropy, Pasadena Weekly, Hometown Pasadena, and La Bloga. She teaches at the Los Angeles Writing Project (LAWP) at California State University Los Angeles (CSULA). She is a member of the Pasadena Rose Poet who present “poetry within reach and in unexpected places.” Carla has an MFA in Creative Writing (Latin America) from Queens University. Previously she ran her PR firm, iMinds PR. Check out carlasameth.com, or Twitter @carlasameth.